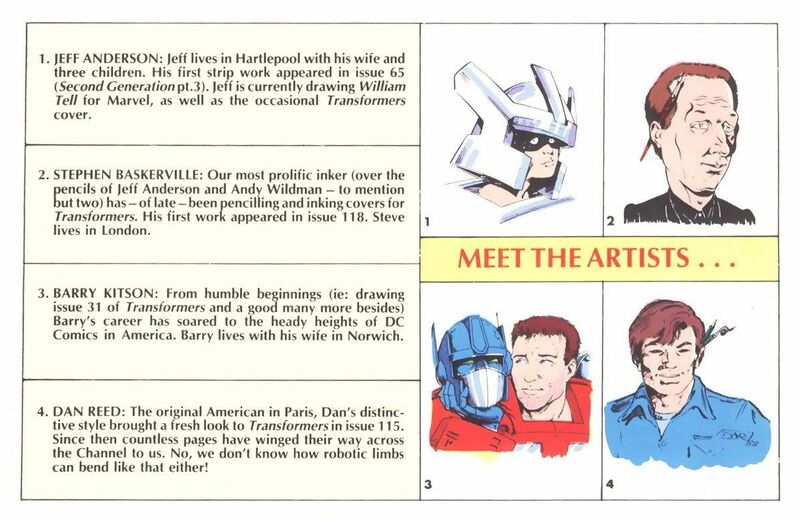 I was browsing a little archive of Marvel UK Transformers comics, from issue #200, but I found a little booklet called Transformers: The Facts. It's all about who is stronggest, fastest, etc. of the Transformers. 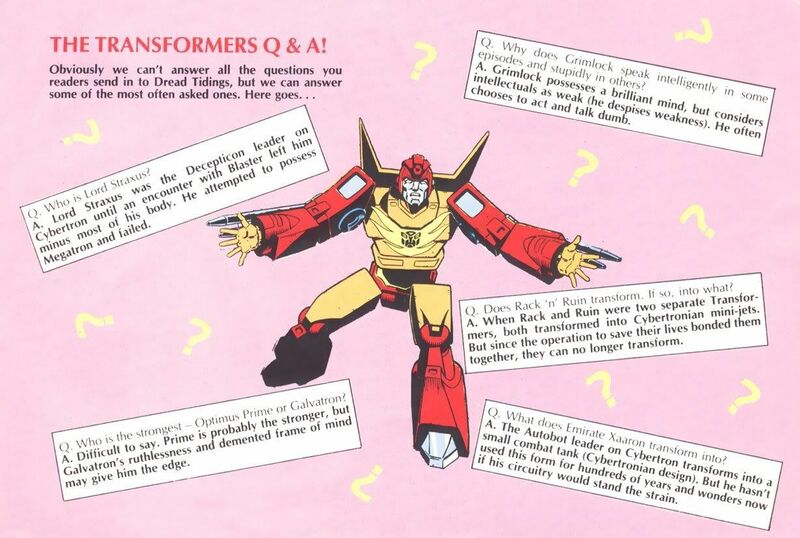 This page in particular intersted me, as I love Transformers scale issues. Metroplex is officially 698 feet tall, and it seems to imply that Devastator is 100 feet tall. How come I've never heard of this booklet before? I didn't see a thing about all the "facts" that it presents. Anyone want to see more pages? 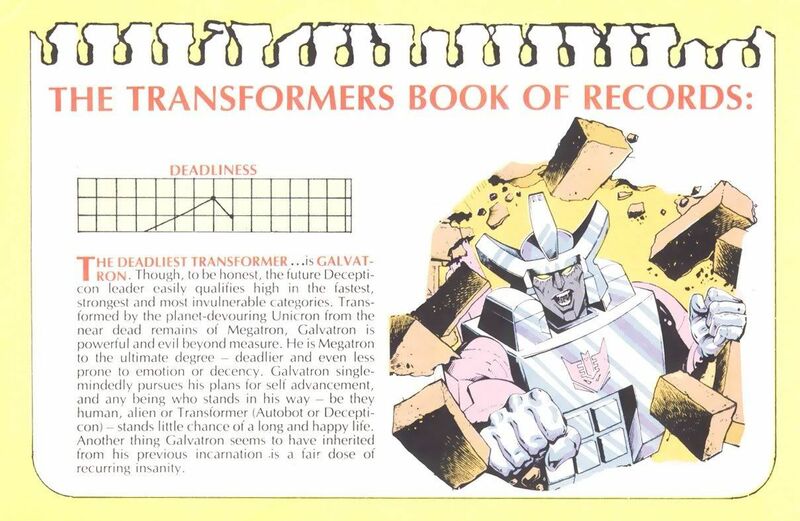 It has more fun facts scattered in it's pages, like what are Rack'n'Ruin's alt modes, who is the strongest transformer for his size, and bios and pictures of the Marvel Transformers artists. Edited by mignash, 16 October 2009 - 06:42 AM. Great find. More scans, please. Okay, it's only 12 pages. Here is the whole thing. Might be worth mentioning in trivia sections of the Wiki or something. More please, indeed. I've never heard of this. 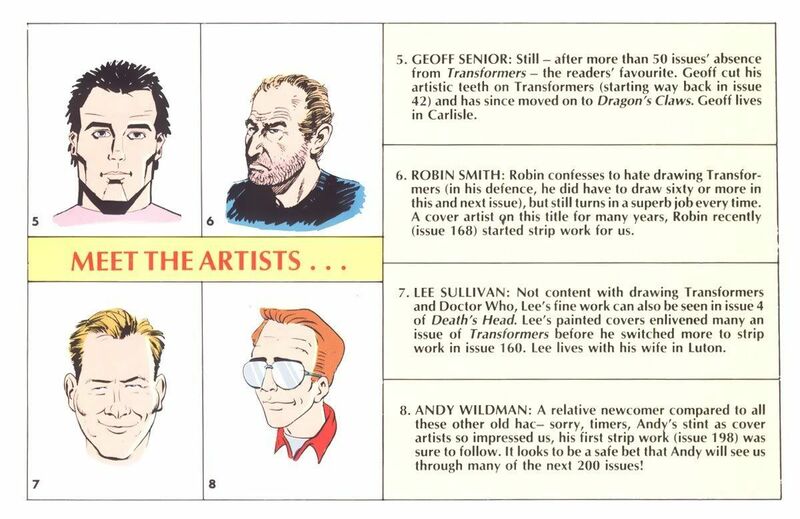 I remember that from the UK comics, I got most of mine secondhand in the late 90's with the free gifts still attached. A lot of the gifts were cheesy trinkets like a little plastic magnifying glass, though. 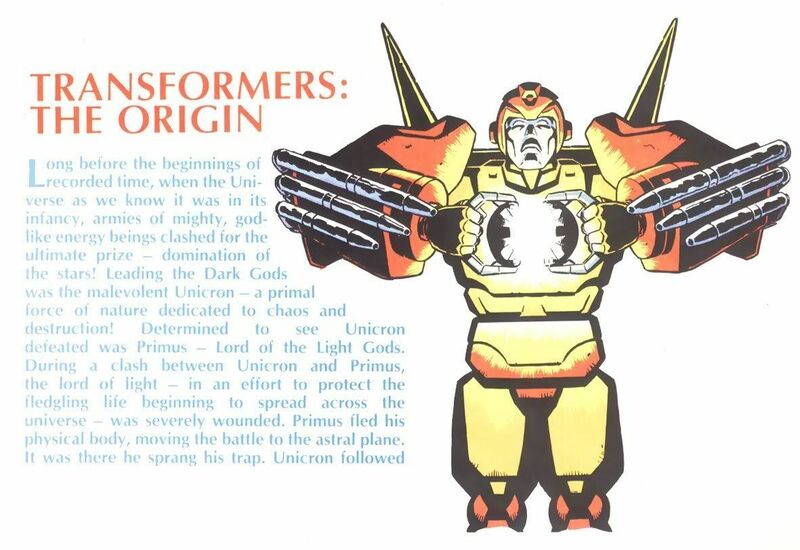 It's kind of depressing reading that pre-multiversal singularity Primus/Unicron thing and seeing that that it made simple, perfect sense. Well, as much sense as you can make of primal gods that leave their bodies and end up stuck inside planetoids... but you get what I mean. The MS doesn't really jibe with it at all. Primus and Unicron fought and shattered each other into neigh infinite pieces. A lot of said pieces apparently ended up inside planetoids that they reshaped and/or populated. 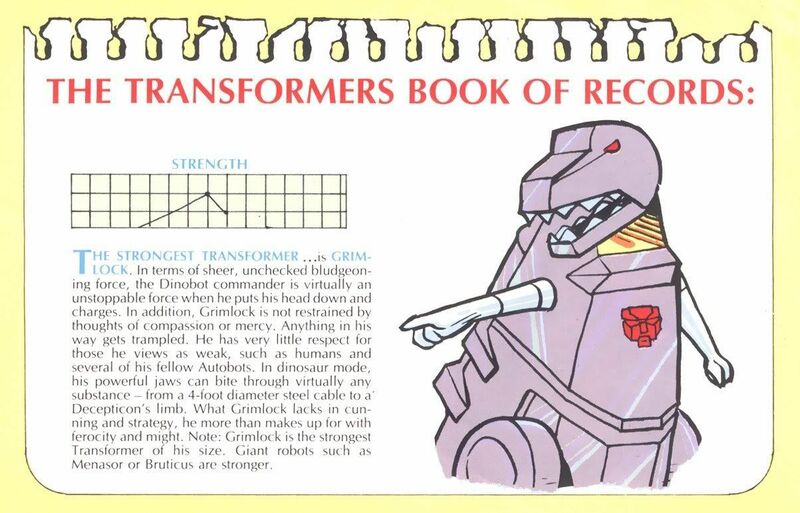 So, apparently grimlock is the strongest transformer now, stronger than metroplex or galvatron? And he is intelligent, but chooses to act dumb to seem stronger? ... I don't like G1. Its so inconsistent. Did you read all of it? It says he's the strongest one of his size class, but giants like Menasor are stronger. 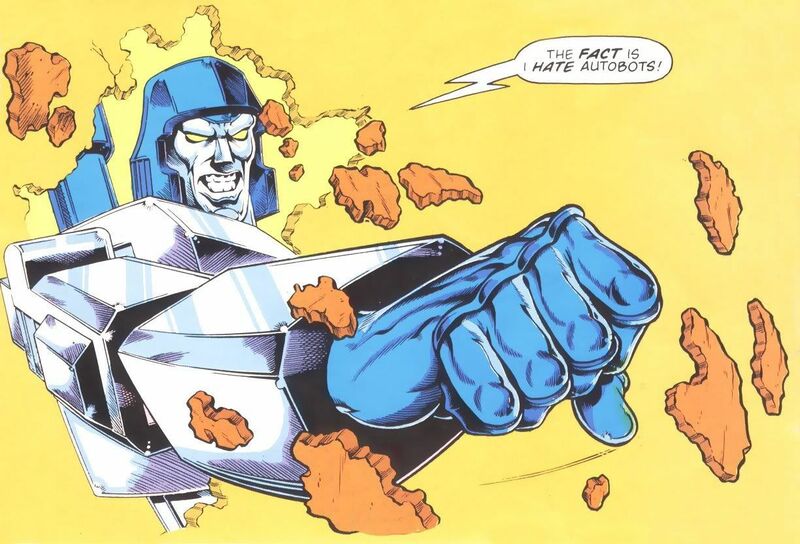 That's not even close to how Unicron works in the current multiverse structure. 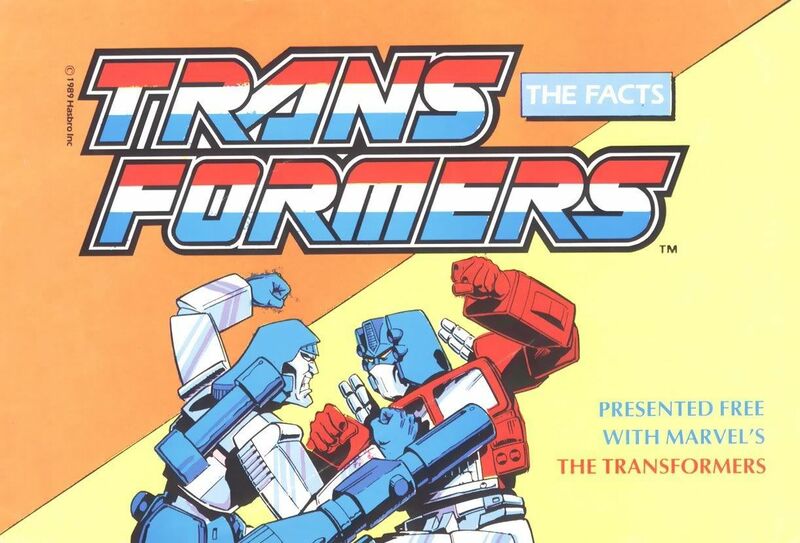 I know it's just my own personal fiction, but when I did my Transformers tabletop RPG the STRENGTH is relative to size - two guys with the same number the bigger one is stronger. So I'm kinda glad to see this makes sense. Grimlock is probably the strongest for his size. Edited by mignash, 16 October 2009 - 06:46 AM. So what about Mini-Bot Brawn then. Physically weaker than Perceptor just because he's smaller? No. In the game (which I admit, I wrote, nothing official, but based on the Champions RPG rules) There is actually a formula in the RPG for strength based on STR stat from the tech spec, and I calculate it based on them being human height, then I apply the "growth" power bonus from the Champions RPG rules (which increase lifting ability 8 times for every doubling of height). I think based Brawn is standing 16 feet tall, and Perceptor is 18 feet (again, just guessing). With their initial STR stats and the size bonus Brawn can lift 20 tons (because he has a STR 9), Perceptor 15 tons (he has a STR of 7). If they had been the same height Brawn would be able to lift much more than that, but Perceptor got more than Brawn for the height bonus. 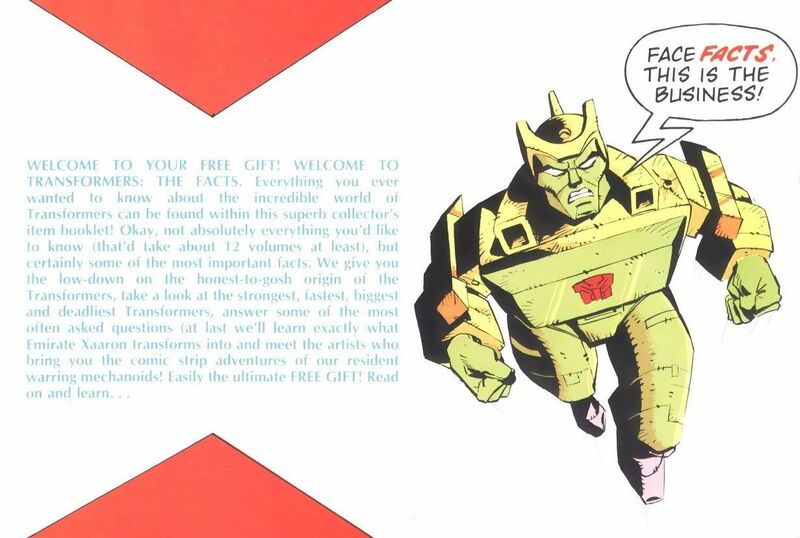 I think in the RPG Brawn ends up being the second strongest of the original '84 Autobots, behind Prime. Big guys like Jetfire, some Dinobots and Omega Supreme and such outclassed him in the '85 line. Jetfire was a case where his sheer SIZE demanded strength, despite having a STR of only 6. If Brawn had been the same size as Jetfire, Brawn would be stronger. Edited by mignash, 16 October 2009 - 08:12 AM. That... is apparently some weird third option you've come up with. It doesn't match the MS origin OR the one detailed above. Unicron was never "shattered into neigh infinite pieces." There's only one of him. 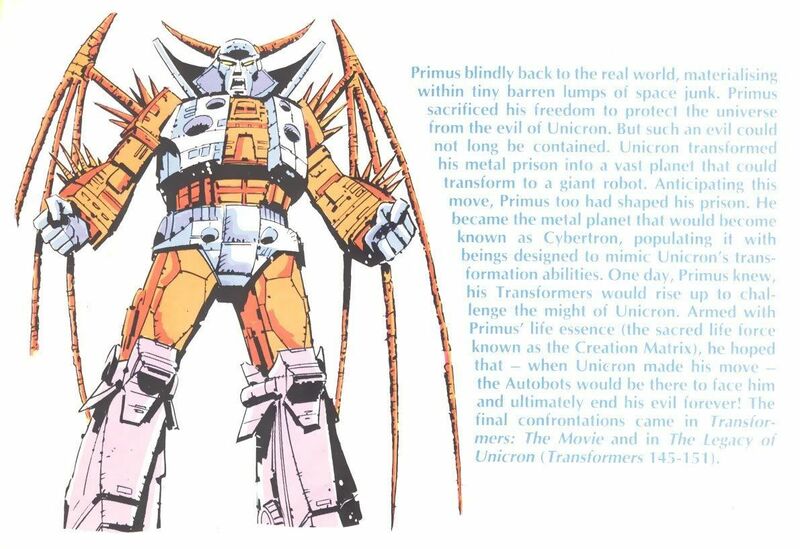 Maybe Primacron built his giant robot that turns into a planet eating planet to look like the REAL Chaos God Unicron? It even started to think it WAS the real Unicron. Edited by mignash, 16 October 2009 - 08:41 AM. Or maybe Unicron shaped his asteroid prison into a rough humanoid/planetoid shape of living spacerock (think Rocklords) and Primacron refined him into his current giant robot god form giving him improved mobility, senses, speed, etc. in exchange for arcane knowledge in some sort of Faustian deal. Also: I love this thing. Sig'd. 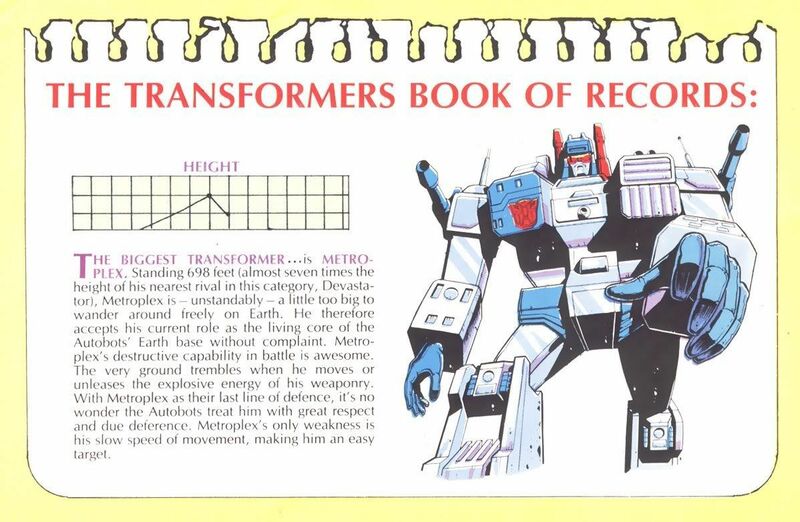 Back to Metroplex, we recently uncovered a Comics Bom Bom issue that said Metroplex is 800 meters tall. This UK comic says a mere 698 feet, which is 212.8 metters. So Metroplex is nearly 4 times as tall in the Japanese continuity than in the UK continuity? It's also neat to note that the tech specs for Broadside say he's 1200 feet long in aircraft carrier mode, so in the UK height of Metroplex with these numbers, Broadside is longer bigger than Metroplex is tall? Interesting. 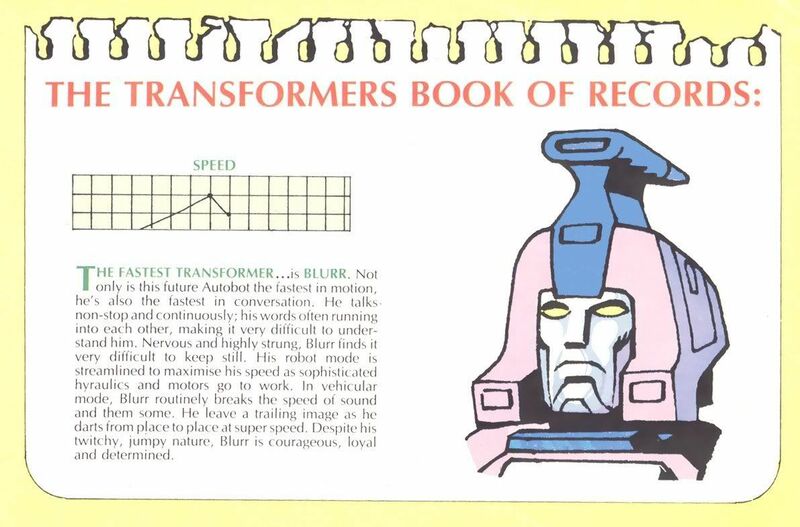 PS - I also giggle at their depiction of Blurr as the fastest Transformer. Maybe they mean reaction time or something, but they made a big deal that he can go in vehicle mode faster than the speed of sound! Yes, I know that's really fast FOR A CAR. Anyone in the UK team read the tech specs of the various jets who have max speed as multiples of the speed of sound? Edited by mignash, 16 October 2009 - 10:26 AM.